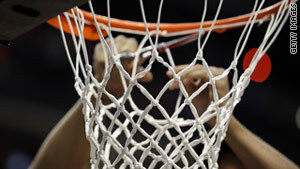 Why do NCAA teams cut down the nets? Winning teams cut down the basketball nets after a big victory. Players hoisted their coach onto their shoulders as he did his snipping. (Mental Floss) -- The men's NCAA Division I hoops championship game is tonight, and we can't tell you whether UConn or Butler is going to win. We can predict two things, though. The winning team will cut down the nets. And CBS will show a highlight montage set to the song "One Shining Moment." Let's take a look at the origins of these traditions. Who's responsible for college teams cutting down the nets after big wins? North Carolina State coach Everett Case didn't realize he was starting a trend in 1947. He just wanted a souvenir. USAToday's Michael Gluskin wrote a terrific piece on the origins of college hoops' net-cutting tradition in 2005. According to Gluskin, Coach Case was so delighted with the Wolfpack's Southern Conference title win that he decided to cut down the nets as souvenirs. Of course, being a pioneer can be tough. Since Case was the first coach to cut down the nets, arena workers didn't have a ladder at the ready for his big moment. Instead, his players had to hoist their coach onto their shoulders as he did his snipping. Case might not have been the true inventor of the net-cutting tradition, though. While he deservedly gets credit for being the college coach who popularized the net-cutting ritual, some sources -- including Tim Peeler's "Legends of N.C. State Basketball" -- claim Case actually brought the tradition with him from Indiana, where he'd been a hugely successful high school coach before coming to Raleigh to coach the Wolfpack. Either way, cutting down the nets may have remained an obscure Hoosier State tradition had Case not brought the practice to the national stage. Mental Floss: Who invented the Gatorade shower? What about the other big postgame tradition, the tourney highlight montage set to "One Shining Moment"? Glad you asked. Any hoops fan can tell you that the song is pretty cheesy and more than a little over-the-top. It's also one of the best parts of CBS' annual coverage of the Final Four. Where the heck did "One Shining Moment" come from, and why do we only hear it once a year? To be fair, there are really only so many opportunities to play a slightly sappy song about basketball. Peter Hyman of The New York Times wrote a profile on David Barrett, the composer of the tune, in 2007. The song is actually the product of an ill-fated attempt to woo a woman. In 1986, Barrett was an unknown 31-year-old folk singer when he went to a bar in East Lansing, Michigan, to watch a Boston Celtics game. When a beautiful waitress sat down next to him after her shift, Barrett decided to spark conversation by chatting about Larry Bird's hoops abilities. Believe it or not, the singer's ploy didn't work. Barrett told Hyman that he resolved to write a tune that could show the waitress who snubbed him just how beautiful basketball could be. The next morning he wrote the song on a napkin in 20 minutes. The song might have faded into oblivion as one of the odder "I'll show them all!" pipedreams a folk singer has ever had. Barrett had a well-placed buddy, though. Journalist Armen Keteyian had been a high school classmate of Barrett's, and he passed a demo tape of the song around to network producers. CBS liked the song and bought it for use in a highlight package it planned to air after Super Bowl XXI. (Yes, the iconic hoops song was very nearly a football song.) The package didn't make the final cut when the broadcast ran long, but the network revived it following the 1987 Final Four. The package with "One Shining Moment" was a huge hit, and CBS has kept it around ever since. Barrett provided the vocals for the original version of the song, but some big names have belted out the tune since. Teddy Pendergrass took over vocal duties for a few years in the 90s before Luther Vandross recorded his own version.